As the rickety bus barely rounded another corner, an audible gasp went through the passengers. A recent blizzard had taken out the road between the high Himalayan villages of Ranipauwa and Jharkot, leaving some 800 meters of mountainous mudslides between us and the first of many 1000-foot cliffs all the way down to the Kali Gandaki River valley below. A few feet on our right were the steep walls of Nepal’s Annapurna mountain range, soaring up to heights of 8000 meters or more. To our left was a sheer vertical drop which began less than a foot away from the trundling wheels of our makeshift vehicle as we wound our way precariously along the peaks. More than once, our bus slid into the treacherous rocks, tilting almost completely sideways over the edge and holding us out over the endless expanse. It would take at least another hour white-knuckling to Kagbeni, the village along the river that would be our stopping point on the trip back to Jomsom, the region’s largest town a few kilometers away. Had I known the road was so poor at the time, I would have made my way down the mountain by my more typical choice of transportation: horseback. But the Himalayas are nothing if not unpredictable and I hadn’t anticipated the late-spring weather to be quite so fickle. My choice in taking the bus was that the trip by horse is somewhat over six hours while the bus is usually only about two, and I had hoped to reach Jomsom before nightfall. Now I, and several other pilgrims to Roof of the World, clutched our seats and each other for dear life, wondering if the half-ton truck would make the trip at all. At least, I remember thinking as we lurched wildly onward, I would have been confident that the horse’s sense of self-preservation was as strong as mine. Over the course of my anthropological fieldwork, one of the most common questions I am asked is if I have fallen in love with Nepal. And each time I am asked that question now, it brings me back to this story. Not because it was a particularly terrifying experience that turned me away from traveling in South Asia (far from it) but because it highlights the variability and unpredictability of working in remote reaches of the high Himalayas. There are ups, downs, and everything in between. What I try to explain is that learning to love Nepal is a little like traveling through it. I arrived in Nepal for the first time in the summer of 2015, just a few weeks following the massive Gorkha earthquake that rocked the country in April of that year and killed thousands in the span of just a few days. In 2016, I arrived in Kathmandu as a Fulbright scholar to begin a year-long research project in the Himalayan district of Mustang (near the Tibetan border to the north). My field site, a Hindu-Buddhist pilgrimage temple called Muktinath, lies just below the Thorong La Pass at roughly 4000 meters (about 13,000 feet), between the Himalayan peaks of Dhaulagiri and Nilgiri. My work focuses not only on the multi-traditional pilgrimage that characterizes Muktinath but on the ritual use of a kind of sacred stone which comes from the river just below. In Nepal, politics and religion are a part of the geography. Since at least the 2nd c. B.C.E., the veneration of sacred fossil ammonite stones has been a prevalent feature of Hindu ritual practices throughout South Asia. But more importantly, these fossil ammonites, called Shaligram, originate solely from a single remote region south of the Tibetan plateau, in the Kali-Gandaki River Valley of Mustang. For the past several years, my work has detailed the ritual use of Shaligrams as objects of pilgrimage in Nepal, as focal points for religious co-participation (Hindu, Buddhist, and a tradition of indigenous shamanism called Bon), and as vital objects of trade with India, China, and among the global Hindu Diaspora. As both late Jurassic fossils (about 165 to 175 million years old) and as symbolic manifestations of divine movement, Shaligram stones blend science and religion together through their journeys across a sacred landscape. However, given Mustang’s long-standing status as a travel-restricted political buffer-zone, my work also highlights some of the ways in which sacred landscapes have continuously come into conflict with political landscapes or, more specifically, how politics and religion don’t mix. For this reason, the challenges of working in Mustang are only partly created by high altitudes and treacherous terrain. One must also be careful about the tenuous political relationships that currently exist between Nepal, China, and India and that have resulted in the constant military presence along the border between southern Tibet and northern Nepal and in the mountain pass that connects them. As an anthropologist, my job is to take particular cultural case-studies and apply them to broader problems; in this case, how sacred stones relate to political conflict, but it is also my duty to communicate the importance of cultural understanding across different nationalities, religions, and ideologies. The upcoming book will hopefully help to bring Nepal a little closer to the rest of the world, to show how the conflicts and triumphs of one place are not so far removed from another. Or how the distant struggles of one people are connected to struggles here at home. Shaligram stones and Himalayas rivers might seem far away and exotic but they’re not as distant as you might think. In the end, I did come to love Nepal though perhaps not in the way that most people assume. I came to respect the awe and power of the Himalayas and at the same time, I learned to give it due deference and to never think of myself as the conquering victor. At great altitudes, there is no such thing. I have made life-long friendships among the peoples of Mustang and the Kathmandu Valley and been invited into their lives and in their homes as a friend and sister, but I have never come to think of their culture as mine. I have participated in ancient rites and learned to sing and speak in languages that date back to the beginnings of human civilization, but I strive to honor their voices above my own. And most importantly, though I set out now to complete a book as a culmination of my research in Shaligram pilgrimage and practice, I do so foremost to return the knowledge I have accumulated to the people of Nepal, India, and Tibet who have helped me to complete this work and only secondly, to improve academic understanding. This does not mean that furthering academic analysis isn’t important but that cross-cultural communication is, at this point, paramount. For me, this is what it means to love Nepal; even if I will never, ever, take that bus again. 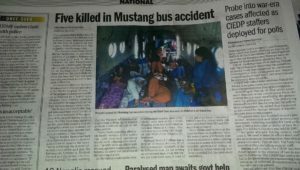 Five Dead in Mustang Bus Accident – Just five days after leaving my fieldsite, a group of pilgrims were tragically killed along the travel route I often take. Posted on July 4, 2017 by H. W.
1. If possible, arrange your travel to Mustang (where the Kali Gandaki flows) prior to arriving in Kathmandu. This can be done through a Nepali travel agent or trekking company easily enough and if anyone is especially interested, feel free to comment on this post for more information. 2. If you are arranging travel to Mustang after you arrive in Kathmandu, you should start with air tickets. From Kathmandu, you must fly first to Pokhara and then to Jomsom, where the pilgrimage route begins. I highly recommend doing this with either Tara Air or Buddha Air as they are the most reliable and are not as prone to random cancellations as some of the other airlines are (you will have to walk or take a taxi to the local ticket office to purchase tickets). The second thing to keep in mind is that these flights tend to only go early in the mornings (due to weather) so you will likely need to plan for at least two days of travel to get to Mustang. Additionally, if you are traveling during monsoon, expect delays and cancellations (some which can run several days at a time during the height of the rains). PLEASE NOTE! Do not anticipate being able to get from Kathmandu to Jomsom on the same day. While theoretically possible if all your flights work out, it is more likely you will end up with at least one day in Pokhara. If you plan to travel to Mustang by jeep or bus (from either Kathmandu or Pokhara), you can do so from any one of the many bus or jeep stations in either city. Private jeeps are expensive though, and can run a few hundred dollars (US) for the entire trip, which can be anywhere from 7 – 9 hours or up to 14 hours by bus. Buses are cheap however, and can get you to Jomsom for about $14 dollars (US). 3. Remember that you will need to get two permits to access Mustang, the TIMS permit and the ACAP permit. Both of these permits are available from the Immigration Office in Kathmandu or at the Immigration and Trekking Counter in Pokhara. The total fee is around $25. 4. The final altitude for reaching Muktinath is over 4000 meters. At this altitude, you will acutely notice the thinness of the air and, depending on your personal make-up, you may find it difficult to breathe or that you are tiring easily. This is to be expected, which is why it is important to plan at least a few extra days in case of altitude sickness or travel delays. If you are able, stop by any one of the many pharmacies in Kathmandu or Pokhara for a couple of doses of mountain medications to keep on hand I would recommend it. Just in case. Additionally, if possible, plan for at least one over-night in Jomsom. The elevation between Kathmandu and Jomsom is reasonably extreme (Jomsom is at around 3,100 meters), so if you are not sure how you will react to the altitude, be sure to give yourself enough time to acclimate. 5. It is possible to find Shaligrams in the Kali Gandaki just north of Jomsom. If you are prepared to trek, you can leave Jomsom early in the morning and follow the route of the Kali Gandaki towards Kagbeni village. Kagbeni is about 2 – 3 hours walk north if you follow the road straight but many pilgrims use this opportunity to find Shaligrams in the river as they go. If you choose to do this, plan for around 4 – 5 hours of walking to reach Kagbeni. Otherwise, you can either stay in Jomsom and look for Shaligrams north of the town (on the far side of the river, past the jeep stand and main gompa) or take a bus (in the morning only) to Kagbeni and stay there while looking for Shaligrams. Either place works, though I have noticed that the quality of the Shaligrams I have found outside of Kagbeni tends to be better than outside of Jomsom. 6. Lodging in Mustang is fairly easy to come by. There are guesthouses and trekking lodges throughout Jomsom and Kagbeni (as well as near Muktinath) that offer reasonable rooms and meals (around $15 a night in Jomsom, $8 – $10 a night in Kagbeni and Muktinath). If you have specific dietary restrictions, however, you may have to plan ahead before you arrive. Most guesthouses have vegetarian or Vaishnava food available but the kitchens are not separated from the preparation of trekking meals. This means that meat, eggs, and other animals products are prepared on the same premises as everything else. There are a few houses and dharamsalas that specifically cater only to pilgrims here and there but you will likely need the help of a local travel agent to help you book them. If all else fails, consider bringing some prepared food with you before you leave. 7. Guide services are generally not necessary unless you plan to do more extensive trekking in the Annapurna region, such as the Thorong La Pass. If you are just planning on Shaligram pilgrimage (Jomsom to Kali Gandaki to Muktinath and then back to Jomsom), you won’t need a full mountain guide. 8. Finding Shaligrams in the river can be tricky but it’s not impossible. For most people, even on their first pilgrimages, they are able to find between 6 and 10 Shaligrams over the course of a few hours. The best advice I can offer is to focus on areas of the river where the water has recently passed. This means along the edges of the streams that flow through the main river bed as well as along the rocky areas where the water has recently moved over. Shaligrams will have a distinct inky black color in the water (or when wet) that helps pick them out from the surrounding silt. 9. The typical pilgrimage route is from Jomsom to Kagbeni (1 day), Kagbeni to Muktinath (1 or 2 days), Muktinath to Jomsom (1 day – with flight or bus leaving the following day). For this reason, try to plan at least 4 or 5 days in Mustang aside from 2 days to get to Jomsom and 2 days to get back to Kathmandu. 10. If you are traveling to Kali Gandaki during the summer months (June, July, August) the weather tends to be fairly mild: 10 – 12 C (50 F) during the day, 5 – 7 C (40 F) at night. During the fall and winter, however, it can get quite cold in the Himalayas. Always look up the expected temperatures for Mustang before you plan on arriving so that you can be sure to pack warm enough clothes.